remotely deployed systems for automatic remote roaming probes, providing roaming testing services to operators – particularly in combination with the remote SIM functionality. test equipment for interoperability, load and functional testing of cellular infrastructure equipment. The edge loaded SIM slots and the LEDs with light-guide option allow the PCB to mount in very flat cases with front operation and even to stack multiple PCB to very dense solutions with more than only 4 modems. All connectors are daisy chained for easy assembly of solutions with multiple PCB. This is also reflected in the options to mount different power supply and USB connectors. Monitoring and control of the modems is realized via two USB-attached onbard microcontrollers. They allow to reset the modems, monitor the WWAN LED and also to reset the USB hub. Power cycling of all modems is realized via standard USB hub power control. Above features allows the continuous unattended operation of the sysmoQMOD in remote sites with no physical access. sysmoQMOD will be delivered without WWAN modules by default. 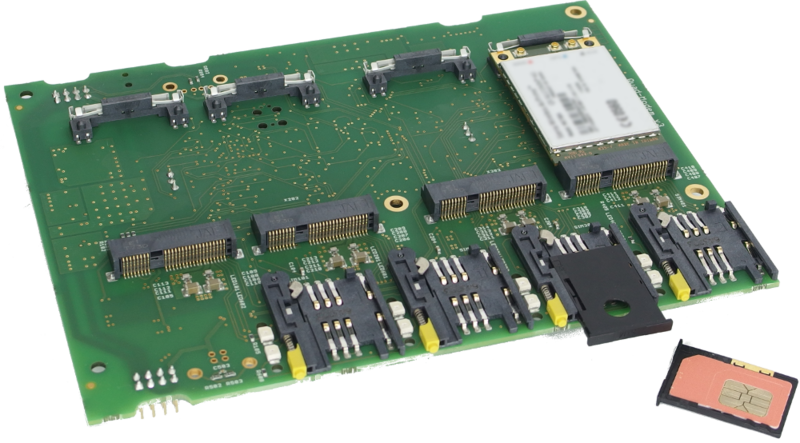 Suitable mPCIE modules for 2G/3G/4G are available from brands like u-blox, Huawei, Sierra Wireless, Quectel, ZTE, SIMcom or Gemalto. Upon request, we can supply your preferred modem model. In addition to the USB connection, the sysmoQMOD exposes the PCM audio interface of selected modems on connectors, enabling system integration with external digital voice components. JTAG and serial connectors for the SAM3 microcontroller are provided for development and debugging firmware and applications. The sysmoQMOD allows also in field reprogramming of it's firmware and USB parameters. The complete firmware and host software components are Free / Open Source Software (FOSS) and can be found at git://git.osmocom.org/simtrace2. Each modem appears as an USB device to the host in the same manner as in standard PC boards and laptops. This allows the use of existing code for regular operation. Control and monitor options of the micro controllers is achieved via the simtrace2 tool, general power cycling of the modems is possible via the USB hub control functionality. One of the outstanding features of the sysmoQMOD is the operation of the modems with remote SIMs. This allows the alternating use of multiple SIMs with one modem by switching between those SIMs via software. Selecting on-board SIM or one ore multiple remote SIMs is possible by means of the microcontrooler. Remote SIMs are inserted in an off the shelf SIM card reader or a specialized large SIM bank. The remote SIM functionality is possible via Internet connection, making it easy to test new SIM cards for roaming capabilities. As the number of remote SIMs is not limited, the remote SIM functionality works also perfect for automated SIM cycling and subsequent testing of e.g. service availability in dedicated local networks. Input Voltage 6-14 V DC (typ 12V DC), 5A max.